On our recent trip to Germany, we quickly discovered that the German Christmas markets are as wonderful as we thought they would be! We were determined to see as many markets as we could. Well, at least one of us was. Thanks to Germany's fantastic train ticket options such as Schönes-Wochenende and Quer-durch-Land, we were able to basically hop on and hop off the regional trains as much as we wanted. Daily tickets were only 44 euros for the two of us versus the 160 euro roundtrip it would've been at one point. In the end, I think we hit up 13 different Christmas markets in 5 cities in 5 days. What a whirlwind trip! Less than an hour after landing, we were sipping hot gluhwein at this market in the drizzling rain. Düsseldorf's Old Town was a magical setting for the Christmas Market on Marktplatz, which stretched across the square at the feet of the statue of mounted Jan Wellem – Düsseldorf’s landmark. The wooden huts were even modelled in the same color and style as on the brick building of the renaissance city hall. 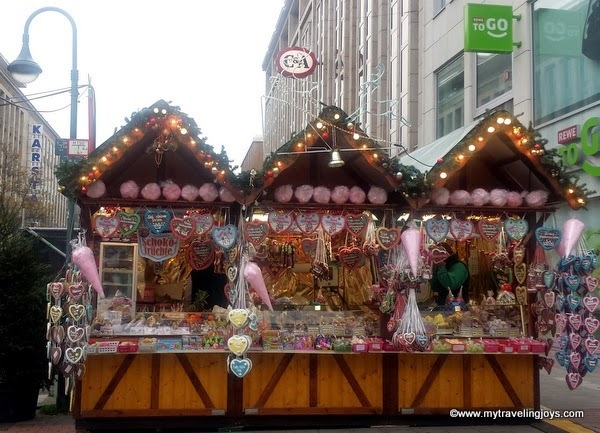 The Engelchenmarkt (“Little Angel Market”), located on Heinrich-Heine-Platz, and decorated with darling cupids and white lights, was one of my favorite markets in Düsseldorf. Christmas Market in front of the Town Hall in Old Town. We even found Polish pottery for sale at the markets - all at ridiculous prices though! The small town of Aachen, about 90 minutes west of Düsseldorf, was recommended by both an Austrian and British friend and did not disappoint. We had less than two hours to explore this historic town before we had to catch our next train, so unfortunately, we simply ran out of time to see everything properly. 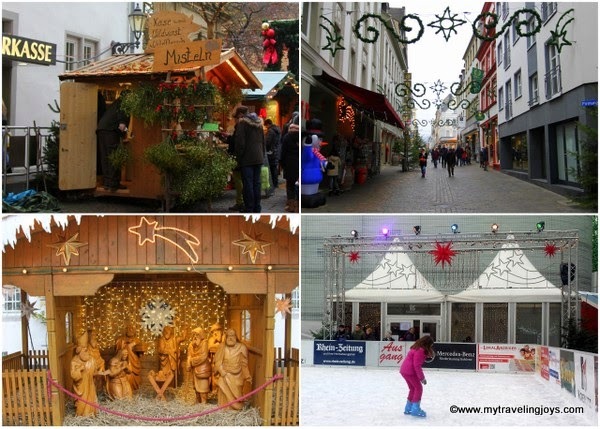 Aachen's two Christmas Markets are set up around the beautiful 1,200-year-old Aachen Cathedral, which was the very first site to be granted UNESCO World Heritage status in Germany. The church is the oldest cathedral in northern Europe, was known as the "Royal Church of St. Mary at Aachen" during the Middle Ages and also was where German kings and queens were crowned for 600 years. 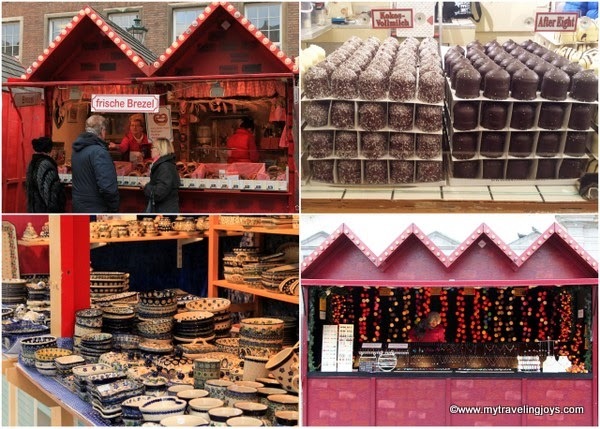 Look for the town's infamous printen - a gingerbread cookie that's often dipped in chocolate. Delicious! Inside the Aachen Cathedral really reminded me of some of Byzantine-era churches we've seen on our travels. Absolutely breathtaking! We bought one of the cute Christmas trees pictured in the upper right-hand corner. Next, we hopped on the train and headed to Cologne where we met JT in front of the Cologne Cathedral and popped inside for a visit. Don't miss the stained glass windows here. 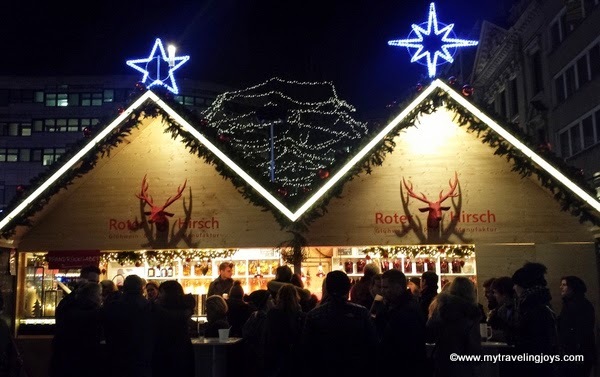 We visited two of Cologne's Christmas markets which were located near the Cathedral around a huge Christmas tree. 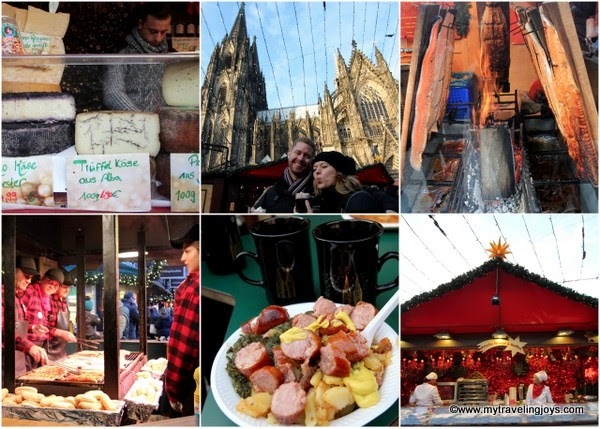 Some of the foodie highlights in Cologne. Hubby and our friend, JT, in Cologne. The Christmas Market at the "Heimat der Heinzel" (Home of the Heinzelmännchen) on Heumarkt was a bit more boisterous and offered a Ferris wheel. After celebrating a belated Thanksgiving, we hopped on a Sunday train for the picturesque town of Koblenz along the Rhine River. 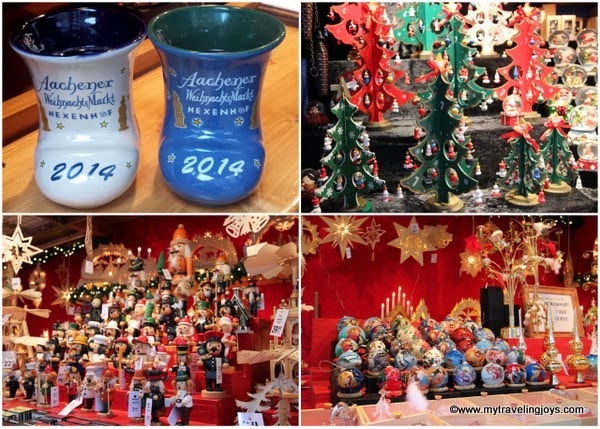 This Christmas market is actually one of the largest in the Rhineland-Palatinate wine growing region. Though the smallest town we visited, Koblenz was super cute and offered all the typical flavors of Christmas including German stolen, gluhwein, bratwurst, etc. There was a second, smaller market with an ice skating rink located at a large shopping mall before you crossed the street into the Old Town. Please forgive the word play, but Mainz really was a-Mainz-ing! I had no idea what to expect here, but I did not anticipate a fairy-tale like setting. Against the imposing backdrop of the 1,000-year-old Cathedral of St. Martin, local craftsmen sold a variety of Christmas specialties such as Advent garlands, wooden toys, ceramic Christmas villages and ornaments. We arrived here about 5 p.m. on Sunday afternoon and the place was packed! We could hardly move! I'm so glad we decided to spend the night here. The church is more than 100-meters long inside and includes an old monastery. The highlights of Mainz include sipping another glass of gluhwein in a cool, wooden barrel, being taunted by a full spit-roasted pig, getting asked if we were American because we wanted mustard with our pretzel, laughing at the expensive Turkish lamps being sold, wandering around the dreamy Candy Land-colored houses and buying a beautiful Christmas village building. I loved the German Christmas Markets and would return again next year in a New York minute! 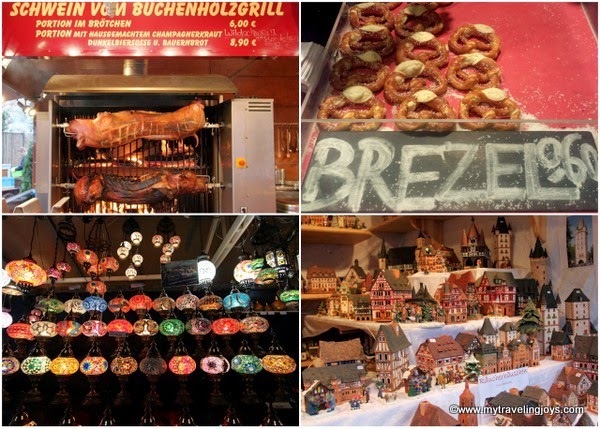 What are your favorite Christmas markets?